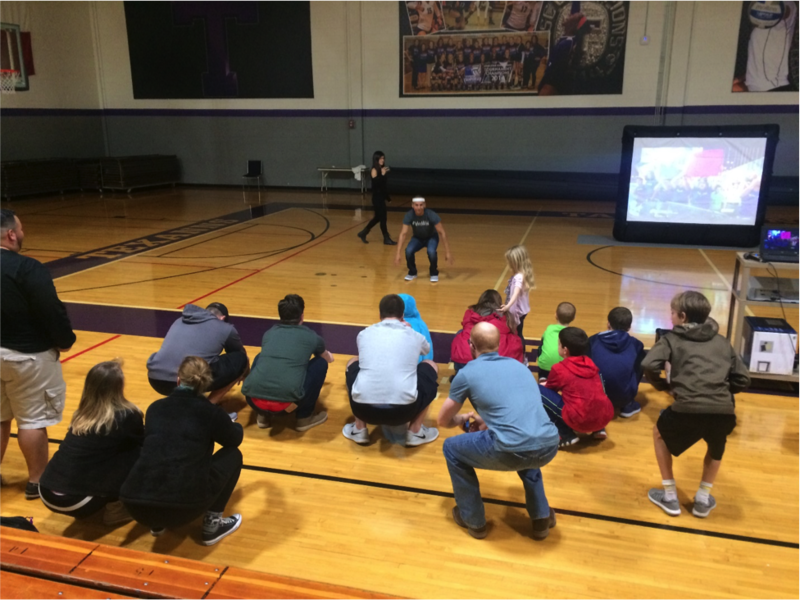 On Feb. 15, American Ninja Warrior competitor, personal trainer, and public speaker Abel Gonzalez, came to Tarleton State University to speak about some of his personal experiences and breaking the cycle of a negative life. Before moving to Edinburg, Texas, Gonzalez was originally from Chicago. He has one sister, and four brothers, with him being the oldest brother. He grew up in a traumatic household that peaked when he was ten and his parents got divorced, causing his family to split. After ending things with his alcoholic father, Gonzalez’s mom decided to raise the two youngest brothers while he and his other brother were left abandoned. After some of his family in south Texas heard about what happened, they sent someone to go pick up him and his brother, and bring them to Texas. This side of his family showed Gonzalez and his brother what love and support was for the first time. Although they were away from the brokenness of his family back in Chicago, Gonzalez still faced many struggles throughout the rest of his childhood and young adult life. He was overweight as a child and went to many different schools, causing him to struggle to graduate from high school. When Gonzalez was about 15 years old, he went back to Chicago to visit his two youngest brothers that were with his mom. While only in middle school at the time, Gonzalez noticed that they were very depressed. After seeing them again two years later, he realized as they were just being completely neglected, their depression had only gotten worse. At 17 years old, Gonzalez asked his mother to let him adopt his two brothers so that he could raise them in Texas. His mother said no, with her reasoning being that she did not think he was responsible and able enough to raise two kids at that age. With full determination, Gonzalez stayed in Chicago for three years in order to prove that he could raise them. “I knew that I had to be a role model for my brothers coming up,” he said. At age 20, he was able to finally adopt them. After he and his brothers were finally able to reach some stability in their lives and his brothers were taking care of themselves, Gonzalez decided to find and work on what he is passionate about: health and nutrition. 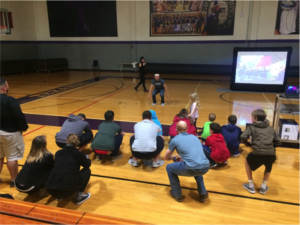 Over 10 years ago, Abel Gonzalez was diagnosed with Rheumatoid Arthritis, an incurable autoimmune disease that affects the joints. Gonzalez says there were days where he could barely move and that he spent three years on pain killers. He was told that he only had seven years left of movement, and that he would need both knees replaced along with his right hip if he wanted to continue to walk. Gonzalez spent three months reading about information on how to stop the illness from ruining him. After two months of testing, improving his nutritional habits and getting off the painkillers, he was able to start moving again with no pain. 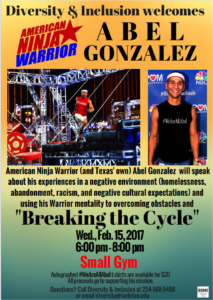 With his love of movement and nutrition, Gonzalez knew he could succeed in the American Ninja Warrior competition. Originally, he did not make the cut onto the show. After going to Dallas and waiting in line 20 hours a day for five days, he was finally allowed as a walk on. Gonzalez earned the title of Rookie Of The Year after his first year of competing. He has successfully made it to Las Vegas twice. Gonzalez also built his own gym back in south Texas in order to keep training for this competition. He did not complete stage two the first time, but was able to finish that stage the next time he made it to Las Vegas. Unfortunately, after completing that stage, he injured his wrist. Since he only had a couple of hours before moving on to stage three, he was not able to get through the third stage without falling. Now, at age 33, Gonzalez has been invited back again to compete and is looking forward to exceeding his previous results. Texan News spoke with Gonzalez once his presentation was over. He said his goals are now to become a world known speaker and win the next American Ninja Warrior Competition. Next Article » Opinion: I am a journalist. I am not the enemy.